LXer received a document from a source with the message "I read your article on linuxJournel about countries growing use of Linux. The attached article was posted in Intel's intranet site." It reveals that Intel expects to sell hundreds of millions of Linux-based computers in rural China. If Intel can sell a Linux computer in rural China, why can't they do the same thing in the United States? Is it such a risk? Look at IBM in the US, they have committed to Linux with facilities, staff, sponsorships of projects. Was the risk so great for IBM? Obviously not. So, Intel, put up! I (Tom Adelstein) received a document from an anonymous source with the message "I read your article on linuxJournel about countries growing use of Linux. The attached article was posted in Intel's intranet site." Indeed, I spent approximately two years writing a web column for Linux Journal about the use of Linux in government in the US and emerging nations. Everywhere I explored, I found Microsoft lobbying against Linux and open-source software. Their tactics seemed deplorable to me. On occasion, Microsoft's partner Intel would join the fray and also lobby against Linux. Last year, Microsoft initiated legal proceedings against a Brazilian magazine and a senior government official, Sergio Amadeu, claiming the company had been defamed. "In defending free software, Mr. Amadeu does not abstain from criticising Microsoft, accusing the company of a 'drug-dealer practice' for offering the operational system Windows to some governments and city administrations for digital inclusion programs," says Microsoft in the claim filed at Sao Paulo's criminal court on 7 June (2004). So, you can imagine my interest when I discovered Microsoft's partner in the Wintel business has "gone over to the other side," so to speak. I always thought that Intel walked a narrow line with Linux, I just didn't know that they expected to sell hundreds of millions of computers in rural China. If the document passed to me is authentic, then that's something about which some people might wonder. Some would consider it admirable. Personally, I consider it somewhat of a betrayal of the American people. If Intel can sell a Linux computer in rural China, why can't they do the same thing in the United States? What about the No Child Left Behind Act signed by President Bush in January 2002? What about the poor in the US who, with proper training, could easily fill the supposed skills gap that has led to the overseas outsourcing of so many crucial, even sensitive, IT jobs? I advocate the use of Linux in emerging countries where the average annual income might run around $150 a year. In the US, we have a large surplus of equipment that could accommodate those people's needs. Those low-resource computers Microsoft has managed to make obsolete will run perfectly with Linux. But they will also work for people in this country. Microsoft and its partners in the United States will not let that happen. They are very successful at influencing the people who supposedly represent us in Congress, the White House, the Judiciary and the hallowed halls of state and local government, to our detriment. But in China, the government sees an advantage to putting computers in the hands of everyone and Linux works just fine for them. Carla Schroder and I have excerpted it to give you an idea of what Intel has going in China. The document has different sections. We broke it up into their major parts and would like to discuss them with you. The original document text is in red and contained within our report for commentary purposes. 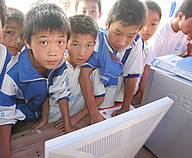 Intel is offering an affordable computer in rural areas of China. In context of the entire document, the product sells for $350 using an inexpensive but high-quality Intel processor, with an expected take rate of 73 percent. The originator of the document believes that they will sell hundreds of millions of units. The operating system marketed with the product uses an unnamed distribution of Linux. get online and gain access to agricultural and farming data. Next, the document showed photographs of Intel's work in rural areas of China. Note the captions. The Cool Bus is part of a project in Huidong County to increase Intel's brand awareness. in Huidong County with slogans promoting the power of information technology in rural life. The second part of the document contained a story of how Intel has made its presence felt in China. The initial part of the story called "Spreading now all across rural China", gives us more of idea regarding Intel's intentions. Again we wonder about Intel's inability to provide the same access to schools in the United States and poorer regions of Latin America. What about rural areas of our continent? What holds back Intel from making its farmer PC available to poor farmers in the US and Mexico? Intel discusses the first purchaser of its farmer PC below. The buyer is Mr. Yushan Yang. He's happy with his Linux computer. It does everything a user could possibly want. features such as a one-touch reset button. who now say they want to own their own personal computers. Of course, we find it interesting that the rural Chinese were unlikely buyers before. We find it even more interesting that they say they want a personal computer after Intel painted their walls and streets, brought in a low price package and provided enough eduation that people can understand the advantages to the quality of their lives by owning a computer. Linux has always stood at the threshold of the "haves and have-nots". From inception, Linux provided people who could not afford proprietary software and hardware with a means to learn UNIX. Now that Linux has the better user interface and the safer operating system, it's available to the Chinese. What better way for Americans to accelerate the decline of our competitiveness than to provide a billion people with computers so they can undercut us in the world market? Must the development of overseas markets be done at the expense of the domestic economy? This is not a complex, cold machine, but a lively information application system to us, says Yushan Zhang. 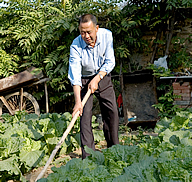 Zhang is a farmer who tends row crops outside his home, and who also runs a small family hotel in Hexi Village outside Beijing. Zhang says he uses his machine for light accounting, and allows his children to use the new PC for homework and games. Zhang very much wanted a PC. He is not alone. A recent government survey revealed that although just 4 percent of households in the countryside outside Beijing< currently own a PC, a whopping 73 percent of residents say they are willing to buy one. We believe that Intel has the ability to assess market opportunities. If they believe that their market opportunity runs a whopping 73 percent, who are we to argue with them. We do question the market opportunity in the US and elsewhere. We wonder how strong an influence Microsoft has on Intel when it comes to marketing a similar product as the farmer PC to others. For a current example of inappropriate influence, in Massachusetts we ask what business does a Secretary of State have contradicting the head of the Information Services department in a public hearing? Once it was announced that the State of Massachusetts was going to require the Open Document Format for all public archives, which does not exclude Microsoft in any way, the heat was on. Do you see similar influence in China? No. Evidently, the pressure's off in China and Intel has the ability to do what it wants without who-knows-what threats. difficult to buy, let alone maintain. quick span of less than one year. first 500 farmer PCs began shipping to rural residents. Well, now we understand why Intel can have success in China. Intel has a MOU with the Beijing Municipal Science and Technology Committee. They can't do that in the US and other places where such an arrangement would create jobs. While for years mainstream computer makers such as IBM, HP and Dell have been professing their love for alternatives to Microsoft Windows, the overwhelming majority of open-source-powered machines are business servers and high-priced workstations. Finding an entry-level home PC that doesn't have a Windows XP sticker on it requires consumers to search through a maze of Web sites. If they try calling a major PC maker, the agent is likely to have a hard time steering them toward a Linux-based or bare-bones system. "There is no champion for Linux clients among the major vendors," PC industry analyst Roger Kay said. Again, we want to understand how Intel can champion a Linux PC in China where it expects to sell hundreds of millions of units, but either can't or won't champion one here. Now, ask any mainstream reporter from ZDnet, C/Net, ComputerWorld, Forbes.com, USA Today and the New York Times about Linux computers. They will say in unison that a user-friendly Linux PC does not exist. Linux is hard, doesn't have the drivers to work with standard Intel-type hardware, much less the newer hardware from China. No one wants it, they want Windows! sales, training, and customer service. countryside outside Beijing alone are likely to surpass 10,000 machines. Hello Intel! You can arrange for this in China but not in the United States? Sales, training and customer service for Linux? You'll go broke doing such a crazy thing. If you don't believe us ask the industry media. Try to market Linux in the US and you'll experience disasters of Biblical proportions. Everybody knows this. (GAPP) programs to promote the benefits of PC ownership. biggest future market for Intel processor-based PCs. Advocates in the open source industry have said this for many years: work with governments to influence the industry in its beginnings. So, our discussion of Microsoft bringing legal action against a Brazilian magazine and a government official might shine some light on Microsoft's strategy. As to that, the admission of a slush fund to keep Linux out of government and you have an understanding of why people call for investigations in to such things as Microsoft's activity with regard to the Foreign Corrupt Practices Act. Intel, do you have anything to say about that? Intel's Anand Chandraseker seems to know how to market Linux. We believe he had good intentions. We continue to request a realistic, no-spin-zone response from Intel. If you knew your approach in China would work, then what's stopping you from using it in the US, Mexico, South America, Africa, the Middle-East and other regions of Asia? paint a village wall in rural China. technology to improve rural life for adults and youngsters alike. extends to 12,000 villages that are home to 40 million people. Copyright Intel Corporation, 2005. All rights reserved. Since we received the document from which we reported above, we have come to question issues that affect the every day lives of people around the globe. Not many years ago, China and India could not feed their populations. People died on the streets from starvation and no one could do anything about it. Today, China and India have become powerhouse economies. Both have become net exporters of food. They achieved their separation from starvation by discovering technology. Other areas of the world have done the same. Intel seems to have wiggled into China almost unnoticed. As a publication dedicated to technology and social change, we appreciate whoever provided us with the material presented above. We only hope that others will consider it significant. The only constant in our lives is change. We believe that the time has come to change the way technology enters people's lives. LXer.com's community focus on Linux news means that stories like these are what we're "all about", after all. Intel's Client Linux Resource Center. Dave Whitinger contributed to this report.